My feeling is that eating out with children in a restaurant should be a continuation of what happens at the dinner table at home, where everyone should eat their greens. When thinking about our junior menu I think about my own children – what I’d like them to eat and what I think they would eat. My view is that at home, children should eat the same food as their parents, just smaller portions. That’s the thinking behind our junior menu. We have three dishes on there, usually one meat, one fish and one vegetarian. At the moment we’ve got two vegetarian dishes and one fish: paella with chargrilled vegetables and halloumi, ricotta, peperonata and lemon thyme ravioli with fresh peas, and a house fishcake with baby spinach, caper and parsley butter sauce. All of these have a good helping of veg, and are a simple rendition of our main menu. What’s good for our adult customers, and popular with them, usually works well for our younger diners. When Nick McGeown (our Group Head Chef) and I look at what should be on the junior menu we think it makes perfect sense to use these popular dishes and just serve a half portion. 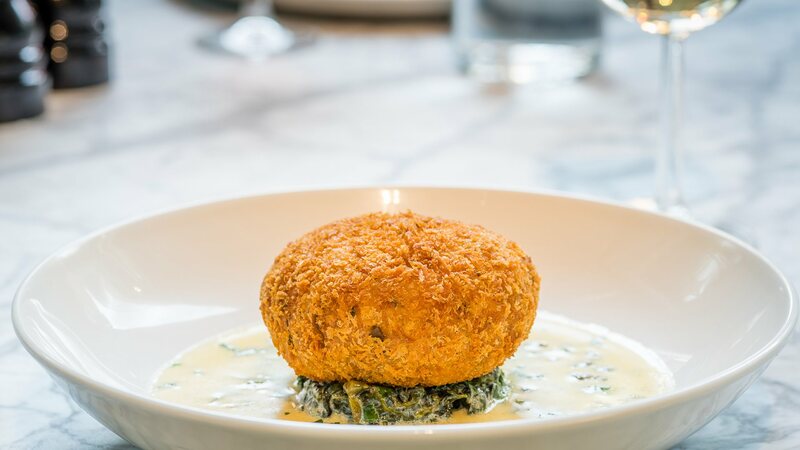 Things like fishcakes – everyone loves fishcakes and it’s one of our best-selling dishes. And even if you serve it with spinach, generally kids will eat it all up. I like to think of Lussmanns as a good example of a group of high street restaurants that serves food for children that they want to eat, and their parents are happy for them to eat. So-called ‘children’s food’ tends to be awful. My intention is that children eating in our restaurants should enjoy tasty, interesting food. In fact, some of our adult customers, particularly some of the older ones, often ask if they can choose from the junior menu – and of course the answer is yes! Then, when children reach the age of eight or nine, just as my kids do, they can order from the main menu and their parents can finish off any of the leftovers. Some children have become obsessed with pizza. There are hundreds of places you can take your children if you just want them to eat that. But why not try them with something else? Give them Wiener Schnitzel and they’ll think it’s the best thing since sliced bread. I like to think that 99% of children will like our food. We do still occasionally have customers asking for pizza but we politely say that this is how we do it. And it’s very rare for us to have much waste, because the children like it and if there are any leftovers their parents tend to polish them off. It is a limited menu and we do charge for it, unlike some big chains. I don’t think it’s expensive (£8.95 for two courses) but I really don’t think that kids should eat for free. Food isn’t free, it has a value and everyone, children included, should understand that. To my mind, giving away food sends out the wrong message. My principles around our younger customers extend beyond what’s on the plate. We describe ourselves as being family friendly, not child-oriented. As a society, I think we are losing our connection with sitting round the dinner table, talking and enjoying a meal together. If you come to eat at Lussmanns it’s like coming to eat in my house. We like everyone to sit at the table so that all of our customers, including those who are dining without children, can enjoy their meal. We want a busy restaurant, with a great atmosphere, but not chaos. I’ve been in restaurants where kids are allowed to get away with murder and it’s not remotely enjoyable for anyone. Apart from that, having children tearing around the place is a genuine health and safety issue. Part of my responsibility as a restaurateur is to share my principles with customers to motivate them and to explain our approach. Serving ethically sourced, nutritious, tasty food that includes plenty of vegetables is a key aspect of that.